Vanessa studied Chinese the summer of 2012 in Suzhou, China as a National Security Language Initiative for Youth (NSLI-Y) participant and was introduced to a whole new world. In addition to learning Chinese, Vanessa found studying traditional Chinese music helped her develop a greater appreciation for Chinese culture. “I was very interested in traditional Chinese music because of how ancient all the instruments are but they still are a relevant part of Chinese culture,” she said. “At first it was difficult to reconcile the China of the past to the bustling and modern country it is today. 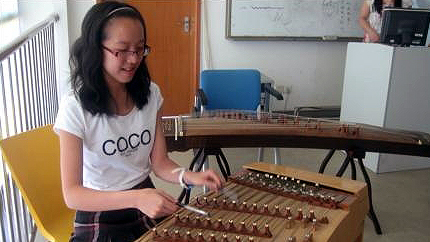 However, through music I could better comprehend how all the facets of Chinese society are still influenced by the past.” To continue her exposure to Chinese music Vanessa conducted a project on traditional Chinese music and instruments and currently takes traditional Chinese dance classes. Vanessa has learned a lot from her music classes but credits her wonderful host family for helping her learn to Master the Chinese language and culture. Vanessa believes her Chinese language skills are valuable and plans to use them for the rest of her life.